This year marks the debut of Ohana—a two-day music festival at Doheny State Beach in Dana Point, CA—featuring performances by Eddie Vedder, Lana Del Rey, Elvis Costello, Band Of Horses and tons more. Produced by Live Nation and SGE, the festival will take place on Saturday, August 27 and Sunday, August 28. 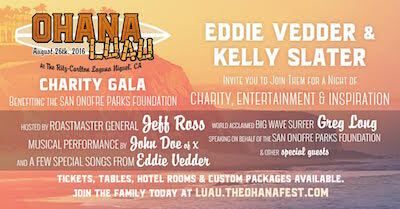 The night prior to the event, Friday, August 26th, Eddie Vedder and Kelly Slater will be throwing The Ohana Luau — a kick-off celebration at the Ritz-Carlton, Laguna Niguel in Dana Point, CA. A night of inspiration and entertainment, the event will be hosted by 'The Roast Master' himself Jeff Ross, alongside Eddie Vedder, Kelly Slater and friends. A portion of the proceeds will benefit The San Onofre Parks Foundation, a California non-profit that cooperatively works with California State Parks to develop, preserve and enhance the recreation and experience of California's unique and beautiful coastal parks. California State Parks-Orange Coast District and the San Onofre Parks Foundation are excited about this opportunity for a fundraising event, specifically focused on the protection and enhancement of public recreational resources along the California coast. It is their mutual mission to preserve these world treasures for the citizens of California. The Ohana Luau will include dinner, drinks, live entertainment and laughs. A hilarious live auction hosted by Jeff Ross will feature various limited edition and one-of-a-kind items, memorabilia, gift packages, and more to benefit The San Onofre Parks Foundation, and world acclaimed big wave surfer Greg Long will be speaking on behalf of the foundation. 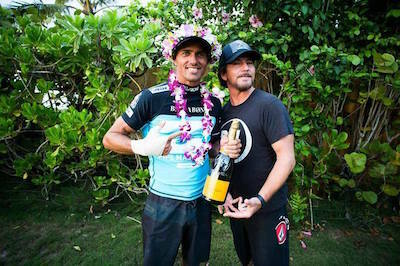 Live entertainment will be provided by John Doe of X, and the luau will feature a few special songs from Eddie Vedder. Dinner will be prepared by chef Brian Sundeen at The Ritz-Carlton, and guests will dine on the bluff overlooking the Pacific Ocean, the hotel pool courtyard, as well as in the Grand Ballroom. The Surfing Heritage and Cultural Center has also lent various priceless surfboards from their collection to be displayed for the night. A number of the items available at the auction have just been revealed, including Kelly Slater signed surfboard and competition rash guard and wrapped and autographed Braven wireless bluetooth speakers, an Eddie Vedder autographed guitar, a Lowers Pro t-shirt signed by over 14 professional surfers, a Katy Helen Art GlassD Mosaic Surfboard, and various other items from Volcom, GoPro, InCase, and many more. An extremely limited number of packages including discounted rooms at the Ritz-Carlton for the weekend and Ohana music festival admission are available for The Ohana Luau charity gala at http://luau.theohanafest.com. The intimate event will be capped at 500 attendees. A California non-profit that cooperatively works with California State Parks to develop, preserve and enhance the recreation and experience of California's unique and beautiful coastal parks. Funds will support maintaining coastal access at South Orange County state beaches. The Ritz-Carlton, Laguna Niguel sits perched atop a seaside bluff with panoramic views of the Pacific Ocean and more than three miles of sandy beach. The resort continues to redefine the guest experience by creating distinctive, unforgettable, and #EpicMemories that are presented against an extraordinary backdrop. A re-imagined surfside retreat that awakens guests' senses with its unique ocean-front setting and remarkable service heritage, the resort is the premiere destination for travelers who desire a playful approach to true Southern California luxury. The resort offers many extraordinary luxury experiences including Raya, 180blũ, The Market Place, enoSTEAK, Bar Raya, The Spa and the Eco-Adventure Center. 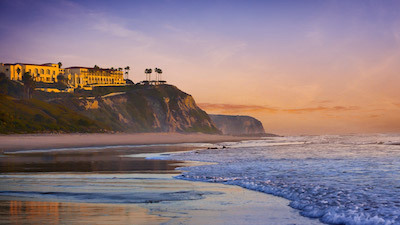 For more information or reservations call 800-241-3333, the hotel directly at 949-240-2000, a travel professional or visit www.ritzcarlton.com/LagunaNiguel.